The HP DeskJet 3650 is a highly-rated, convenient, versatile ink jet printer that is targeted specifically for home personal use. It is extremely easy to configure and has a simplified user interface and software tools. This photo quality personal printer is upgradeable to provide a wide range of printing styles, options and qualities. Its compact and light design make it easy to use on even the smallest and least solid work spaces. 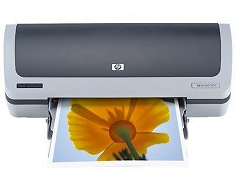 The HP DeskJet 3650 is built to be durable and reliable, providing many years of quality photo and text printing. Black and white text document printing is made easy and convenient, providing decent quality output for personal home use and limited small home business use. This printer is perfect for the individual who wishes to print school assignments, letters to friends and family, or even small business spreadsheets and invoices. Print quality for both black and white printing can be set to as high as 1200 x 1200 dots per inch through an easy and convenient quality selection menu that eliminates time wasted with detailed job programming. Simply select the document to print, select print quality and select number of copies. It's as simple as that. With economy and personal budgets in mind, this printer is also designed to connect to the most base PC systems and comes with drivers and software that are compatible with all previous Windows and Mac operating systems. Although the total duty cycle for the life of the unit is 20,000 pages, the low print speeds limit total monthly personal home usage to 500-1000 pages per month, giving the HP DeskJet 3650 a total life span of 2 to 4 years, which is excellent value for the money. An automatic sheet feeder is capable of holding up to 100 sheets of plain paper and up to 10 envelopes. An output tray holds up to 50 sheets of plain paper, making multiple-page homework assignments and other personal writing projects extremely easy to do with plenty of temporary paper storage space. A wide variety of print media sizes and types are supported. Speed is sacrificed in exchange for durability and reliability, as black text printing on plain paper maxes out at 17 pages per minute at draft quality and 8 pages per minute at normal quality. At the maximum available print quality, black text printing on plain paper can take as long as 10 minutes per page. Full page color printing on plain paper can take even longer, at a painfully slow 20 minutes per page. A color image printed on 4 x 6 glossy photo paper can take up to 4 minutes per photo. These limitations are a result of this model being targeted to personal home users who rarely require top print speeds. A second tri-color photo ink cartridge is required to utilize the printer's maximum photo quality print settings, more than doubling the cost of consumables. Like most ink jet printers, print heads on this model can become clogged if the printer is not used regularly, necessitating periodic test page printing to keep nozzles and tubes unobstructed. Printer maintenance and cleaning features that come standard with bundled drivers are rarely sufficient to clean clogged ink cartridges on this and similar models. With the type of sheet feeder and output tray system that is installed on this model, it is easy for printed documents to be pushed out of the output tray as they pile up, causing document smudges and contamination. This printer has a relatively small footprint and limited space inside for print cartridges. As a result, color cartridges come in one unit, with cyan, magenta and yellow colors all included, necessitating replacement of entire cartridges when one color runs out. 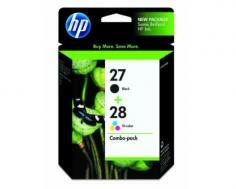 Review it: "HP DeskJet 3650 "
The HP DeskJet 3650 comes with one black and one tri-color starter ink cartridge. 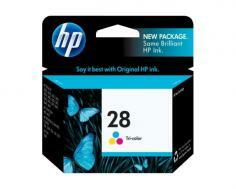 The black cartridge has a maximum yield of 220 pages and the tri-color cartridge has a maximum yield of 190 pages. A separate, photo tri-color cartridge can be purchased, providing photo-quality printing results with fade resistant ink, but with a maximum yield of only 140 pages.